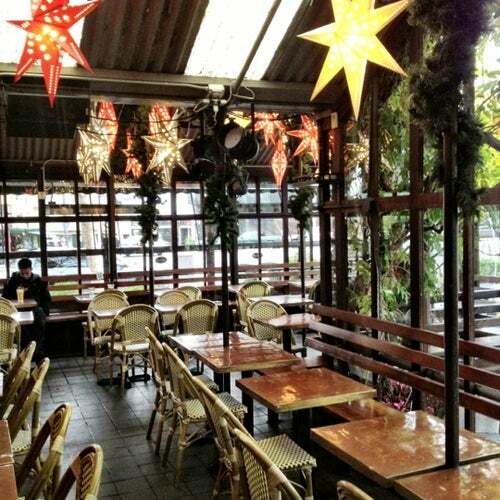 This greenhouse-looking cafe is a well-known social hub of the Castro, located at the key intersection of Market/Noe/16th Street, and a great place for coffee, food, and people watching. First and foremost - this is a great place to see and be seen. Lounge with a coffee or tea, spend time with friends, sit alone to write and read, get a little something to eat, it all works here. Open air and inside all feels very open with lots of light. Decided to catch up with an old friend I'd lost touch with (hey marriage does that) and we had coffee-n-chat, and loved how calm the place seemed even when busy. Food here is standard café food and is quite good, although the staff seems to be put-off or too busy at times to help out the patrons. But it is a good place to "soak up" queer SF. I went to this place last week after a long, long time away from SF. The cramped nature of the eating area reminded me of New York, and so did the cloudiness of the day outside - I think every time I've been here the weather's not been fine and I've sat inside. The proximity to your neighbors can be a good thing though, since you might strike up a conversation with the muscle cutie whose elbow is touching yours. The coffee is excellent, and the food is very good. The staff is unfriendly at first, but easily disarmed, as if they're just waiting for a smile to open them up. Did I mention that the coffee is excellent? And they offer it to go also. Cute guys with dogs sit outside and sip and altogether the crowd is a nice mix of male and female, young and old. I found myself wanting to talk to the older ones and ask them if they knew Sylvester. One gets the feeling that there are some great stories and interesting people behind the worn faces here - I suggest trying to get a stranger to talk after you've cranked yourself up to conversation level on their coffee. Sit outdoors, protected by plexi windscreens, and eat delicious fries, burgers, salads, and sweets while chatting with friends or reading. Very comfortable, relaxed, good food, and friendly. Love sitting out in the patio on a sunny day, reading, working, chatting with friends etc. Their half chicken is awesome!! Best Egg Benedicts in town..
and I just LOVE their Salmon version of it.. delicious creamy Hollandaise.. Excellent steak salad and beautiful to sit outside when weather is nice ! From the smallest kitchen in the Castro comes some very good food, and the drinks on offer will appeal to all. Mellow vibe, sunny patio very welcoming, inside just as nice. Enjoy! My favorite hot chocolate in the city. you stand in line for upscale diner food, but this is one of the best places in the castro for hanging out in the very cool shed like cafe and the outdoor patio, perched in one of the best locations in the city, the corner of market and noe. great people watching, and on a sunny day sipping iced coffee on the patio or sidewalk tables it is nothing short of heavenly. The food here has since improved with the arrival of new executive chef, Bronson, who is always introducing new items to the menu. The crowd that comes by for food, coffee, drinks, or just to meet up with friends; are definitely an assortment mix of the gay population of San Francisco. Favorite thing at Cafe Flore - $5 for two margarita's on Tuesday afternoon/evenings. I have to admit they don't have the best coffee nor the best food or dessert. But I have to say I do love the location and the ambiance of this place. It's a great place to meet up with friends, dates and tricks...so I guess skipping coffee and dessert and just go straight to his apartment...LOL! Also, I highly recommend Friday nights for their groovy sounds! If you want to avoid crazy teeny-boopers at the Cafe and the snooty queens at the Lookout then check this place out!